Here are some examples of where and how to find connections on your social collaboration network. 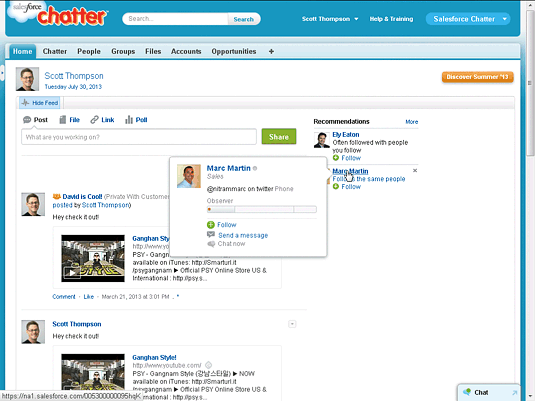 These examples include a couple of demo environments provided by Jive Software and Salesforce.com’s Chatter business, respectively, which are stocked with fictional users and content. If your organization is using another social collaboration environment, the specifics will be different, but you’ll get the jist of the basic concepts. So, pretend this is your company and your social collaboration network. One good place to start is with the boss. You know, The Boss. You probably want to keep tabs on the messages that the CEO is putting out about company direction. It’s easy enough to look him up by name and follow him. 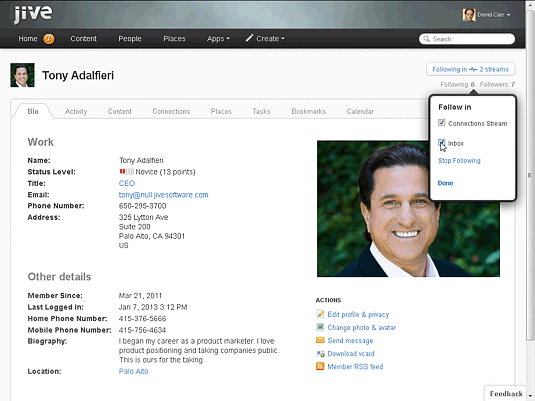 The following figure shows a CEO’s profile in Jive. Note that the Follow button that appears on this profile (and anywhere else you view profile information) gives two options: Connections Stream and Inbox. The default is Connections Stream. If you choose that, you see his message scroll past in the combined social stream for all the people whose activity you follow, which is great for casual monitoring. However, because this is The Boss, you may want to make sure to not miss any of his updates. Select the Inbox option, and Jive sends a notification to your inbox anytime The Boss updates his status. One of the things that distinguishes social collaboration from previous generations of collaboration systems is how it makes profile information available everywhere, allowing you to find people through the documents and other content they have created. 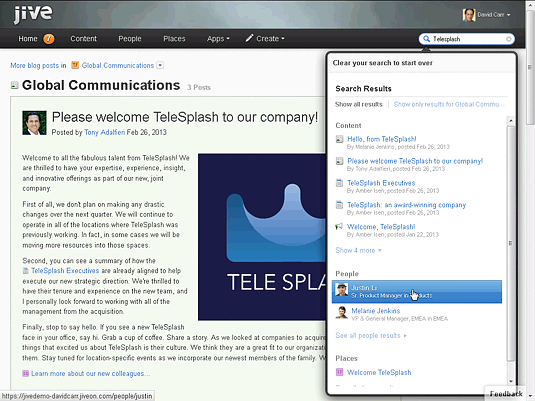 Now imagine that your company recently acquired a firm called TeleSplash and created a Jive space to welcome TeleSplash colleagues into the organization. If this merger affects your job, you probably want to find out as much as you can about it, including the people being absorbed into your organization. One of the items you see in the content directory for this space is a blog post from the former TeleSplash CEO, who is now taking on a new executive role. Just by hovering your mouse over her name, you get a pop-up contact card with her title, phone number, and e-mail, as shown in the following figure. From here, you can click the Follow button, or click Message to send her a direct message. 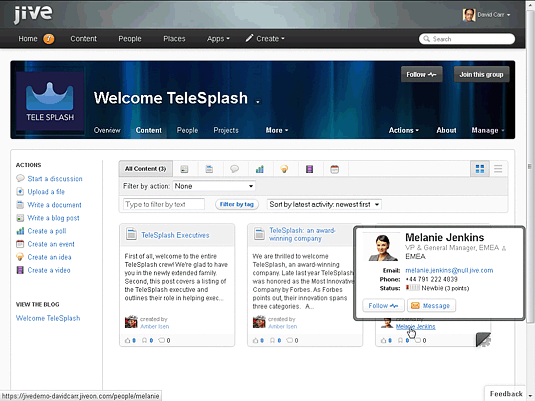 Another way to find people associated with TeleSplash is to do a search on the name of the acquired company, which will let you find the people whose profiles mention their history at TeleSplash. In the example shown in the next figure, the matching profiles are shown at the end of the search results, below the matching documents. This summary view brings up a couple of the most relevant results, but you also have the option of clicking a See All People Results link that may reveal additional matches. 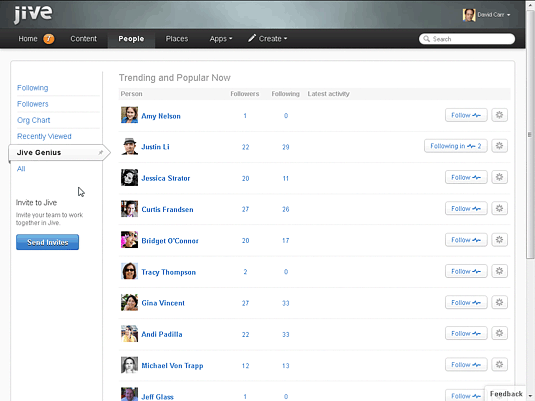 Then, after viewing the profiles of these employees, you can choose which ones to follow. Often, you’ll find the best people to network with by identifying common interests rather than by searching for them by name or location in the organizational hierarchy. A good place to look for these kindred souls is in group discussions. For example, if you’re responsible for the search engine optimization (SEO) of your division’s website, you may want to connect with an SEO interest group that includes representation from other parts of the company — or establish one, if it doesn’t exist. And as you participate in discussions, you will learn which members of a group have the best insights, business acumen, and connections within the company, making them good candidates to add to your network. Just like with documents, blog posts, and comments, posts in a discussion thread link to the profile of the author. By hovering your mouse over the name or profile photo, you can call up a pop-up contact card as shown in the following figure. You can click through to the individual’s profile page or click the Follow link on the contact card. Yet another way of building your network is to take suggestions that the software makes for you. As part of its Jive Genius feature, Jive provides a recommender service, which displays lists of profiles and content that the system knows you haven’t seen before and that the software thinks you might find interesting, based on your past patterns of interaction. At the most basic level, Jive Genius displays trending and popular profiles and content, as shown in the following figure. As the system learns more about you, it shows more personalized recommendations. 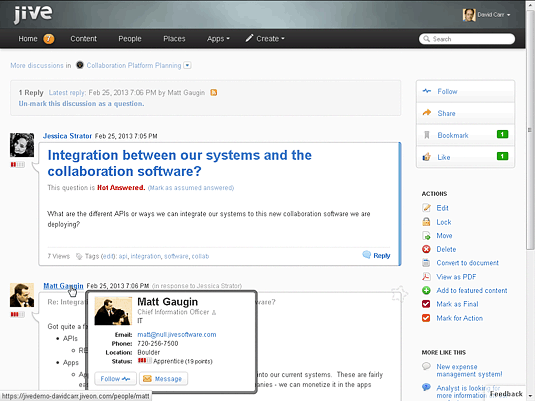 Although the user interface details will be different, you can use similar techniques with other social collaboration platforms. On Chatter, user profiles don’t provide as much room for users to enter autobiographical details about themselves. Instead, a profile page includes contact information, a brief About Me blurb, and the owner’s latest posts. However, Chatter presents similar opportunities to find people to add to your network through status updates and group discussions. Chatter also offers up recommendations of people that its analytic software identifies as likely good connections for you, as shown in this figure. 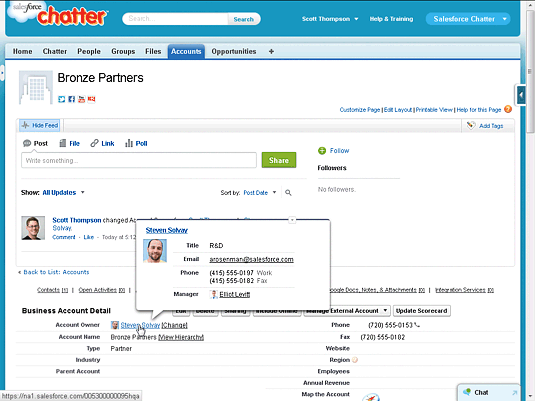 One of the big things different about Chatter is that it’s closely linked to Salesforce.com software for sales and customer service. From Chatter, you can browse customer accounts and choose to follow a specific account — meaning that you’ll receive updates about any activity related to that account in your Chatter activity stream. In the next figure, notice that the Follow button to follow the Bronze Partners account is in the upper right of the screen. The account record also includes a designated account owner, who is the person responsible for maintaining the record (and probably also the relationship) for this customer. To get more information about the account owner, hover your mouse over the name to display a pop-up contact card, as shown in the figure. If this is someone whom you want to keep tabs on, click through to his profile page and click the Follow button there. These are just a few of the techniques you can use to explore your social collaboration network and find people to connect with. Growing your network is to some extent a numbers game. The more people you connect with, the more you can get network and meet more folks. Just remember that it pays to be selective. Identify the people whose work and ideas are most relevant to you and your role within the company: namely, those people you can learn from and who will learn from you in turn.